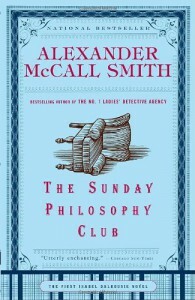 Alexander McCall Smith combined sleuthing and philosophy. The protaganist, Isabel Dalhousie, is the editor of a philosophy journal. The mystery is engaging but is secondary to the characters and Smith adds information on philosophy and Isabel makes decisions based on it throughout the book. The Sunday Philosophy Club is mentioned but does not figure in this book. All in all, I loved the characters and the Ms. Dalhousie's thinking and making decisions based on philosophy.